I loved the flavor in this stir fry! You might think to yourself that if you’ve had one stir fry, you’ve had them all. How different could they possibly be? I think it depends on what your ingredients are. There are so many different flavors out there, whether it’s the sauces you throw in or the ingredients and vegetables that you include. Recently I had so many veggies left in my fridge that I didn’t want to go to waste, I decided to do a stir fry. I wanted to try a new one though, just to see what was out there. 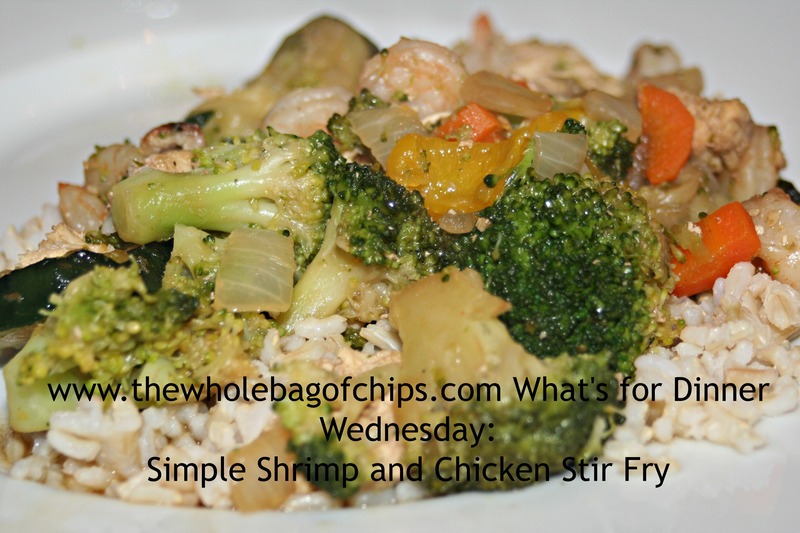 I also knew that besides the veggies I wanted to utilize, I also wanted the stir fry to include both chicken and shrimp, since I have kids who like one or the other, but not both. I Googled “shrimp and chicken stir fry” and chose this one from http://hipfoodiemom.com and I really loved it! I had everything the recipe called for except mushrooms and snap peas, but I also had zucchini so I threw that in instead. It seemed reminiscent to me of a “Dump Cake” recipe I once read, where you literally just dump all the ingredients in together. That’s what I love about stir fry recipes, you can really throw in a lot of different things. I think that the difference between this recipe and some of the ones I’ve tried in the past are the sesame oil and the balsamic vinegar. Those are new to any recipe I’ve tried before. Here is the recipe as Hip Foodie Mom has it on her site. I hope you’ll pay her a visit! It was the unique combination of sauces that made this recipe so good! Get all your veggies prepped: washed and chopped. And cut up your rotisserie chicken. Heat the olive oil in a large skillet or wok over high heat. After a minute or 2, throw in all of your vegetables and allow them to cook until just tender, for about 2 minutes. Stirring occasionally. After 2 minutes, reduce the heat to medium-high and cook your vegetables or another 3 minutes or so. Season with a little salt and pepper. Add the shrimp and chicken. 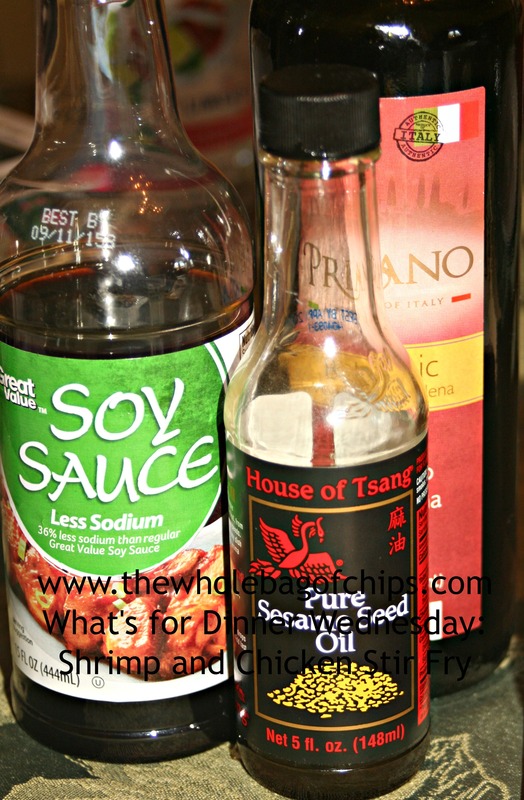 Drizzle the sesame oil, add the low sodium soy sauce and a splash or 2 of balsamic vinegar. Taste and add more soy sauce or balsamic vinegar if needed. Cook for another 5 minutes or so. Serve over brown rice. Hey there! Thank you for the link back! I’m so glad you enjoyed this! This is definitely a family favorite at my house! Cheers, Alice. Thanks for sharing such a great recipe Alice! I’ll be visiting your blog again soon, I’m sure!